Overview: The Ethio-Semitic people cluster encompasses groups primarily found in Ethiopia who are ethnically Semitic. These peoples probably migrated from Arabia millennia ago. Most live in the more densely populated highlands of Ethiopia and Eritrea. Most are Orthodox Christians. 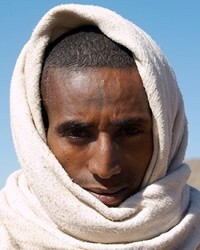 There are historical and biblical records going back over 4,000 years referring to the Ethiopians and Cush and Punt (probably inhabited by ancestors of the Somalis, Afar and Beja), with many trade links for spices, woods, slaves, etc.